I’m not entirely sure where to start with Captain Marvel #16, and there’s two major contributors to the apathy I feel over it. The first is the art, and the second is Infinity. Overall, this issue is completely forgettable. While the dialogue is good, I’m finding myself left almost entirely cold by Infinity as an event. I’m bored with the repetitive nature of the narrative, and I’m sad that Deconnick’s wonderful title has been sucked into it. This month, Deconnick has Jen Van Meter on board as a co-writer, and it shows. While previously, Captain Marvel has proven to be a fresh, clever, and easy to follow title, #16 feels far more ‘Hickmannish’ (a term I’ve coined to describe anything that gets sucked into Jonathan Hickman’s endless, talking in circles, deliberately obtuse style on his current Avengers and New Avengers runs). While Hickman is the main writer for the event, I fail to see why his narrative style must creep into a title that has otherwise featured a completely different tone. That’s not to say I didn’t enjoy certain parts of the story – although they were mostly the dialogue sections – but I sincerely hope my favourite title isn’t drawn into any major events any time soon. There is some good exposition about Carol’s Binary powers, that is a simple introduction for newer readers, but not overly repetitive for those who have been reading Carol’s story for a while. Deconnick and Van Meter cram in a lot of characters, as is usual for a CM book, but this time around it doesn’t feel as seamless as usual. I felt like there were a lot of Avengers here, whereas normally that isn’t the case. Back to the first major problem I have with this issue – the art. There really is no way to put it other than it’s really unpleasant. Bodies are bizarrely proportioned, there’s little to no expression or movement, and some of the facial expressions are downright bizarre. The colouring is too bright and garish, the page layouts are uninspired, and at times quite irritating. 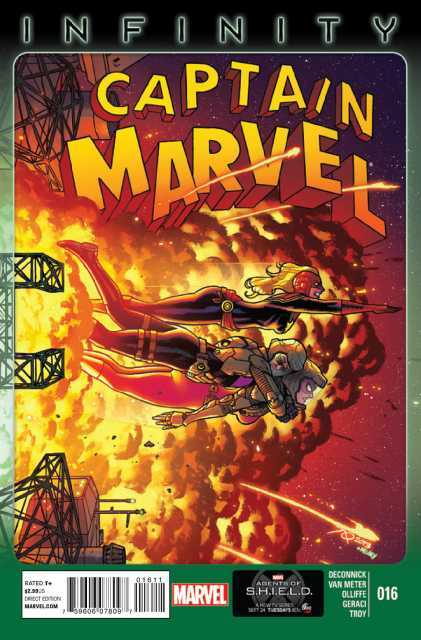 This book does little to advance the Infinity storyline (or what there is of one – I’m still waiting for Hickman to get to the point), and really only serves as an introduction to Carol’s Binary powers. The bottom line? Don’t skip it, because CM is a wonderful title that needs to continue, but don’t judge this series on a decidedly mediocre issue.